After his lawyers succeeded in delaying the start of the trial by two months, former Malaysian Prime Minister Najib Razak appeared in a Kuala Lumpur courtroom on Wednesday for the first time, marking the beginning of a historic trial where the former leader of a political party that dominated Malaysian politics for 60 years could face decades in prison, the New York Times reports. The dozens of corruption and graft charges levied against Razak stem from the looting of 1MDB, the government development fund that was looted of an estimated $4.5 billion by Razak and members of his inner circle. More than $700 million of that money was allegedly funneled into bank accounts controlled by Razak and his wife, Rosmah Mansor, who has been charged with 17 counts of money laundering and tax evasion. Wednesday's proceedings marked the beginning of the first in what's expected to be a series of four trials held this year. Right now, Razak is facing seven charges of criminal breach of trust, abuse of power and money laundering stemming from $10 million that prosecutors say was transferred from former 1MDB subsidiary SRC International into accounts controlled by Razak. The former prime minister has pleaded not guilty. After losing to his former mentor Mahathir Mohammad during Malaysia's heated 2018 presidential race, Razak's successor immediately ordered an investigation into Razak's wrongdoing, which ultimately lead to charges against Razak and Goldman Sachs, which infamously circumvented its own compliance controls to held raise some $6 billion for the fund in three separate bond offerings. The trial marks the first time a former prime minister has been held criminally accountable for acts of corruption committed in office. Attorney General Tommy Thomas told the court that Najib had once "wielded near-absolute power." "The accused is not above the law, and his prosecution and this trial should serve as precedents for all future holders of this august office," Thomas said. 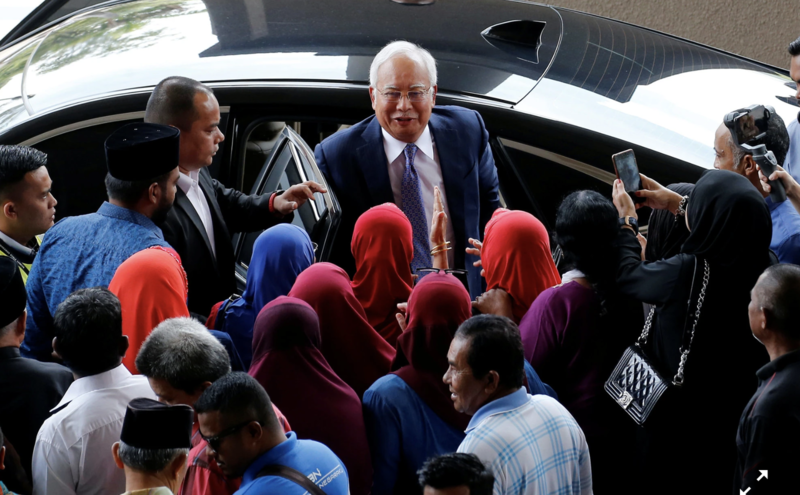 As the prosecution began laying out its case, Thomas alleged that Najib laundered money stolen from SRC by spending $130,625 at a Chanel store in Honolulu, by doing renovations at his two his residences and handing out campaign money to politicians from his former ruling coalition. Defense lead counsel Muhammad Shafee Abdullahn dismissed these allegations as "rumors." Calling its first witness, a deputy registrar from the Malaysian companies commission, explained the corporate structure of 1MDB and SRC to the jury, per the FT. Though Razak was intially quiet after being charged, he has emerged in recent months as a vocal opponent of Mahathir's government, even helping a member of his party win a special election earlier this year. According to the NYT, Razak is probably hoping for a pardon should his party retake control. Though Malaysia's case against Goldman will be carried out in a separate proceedings, the bank's involvement in the scandal, which was masterminded by fugitive banker Jho Low, currently believed to be hiding in China, will likely factor into the Razak trial, since he met personally with senior Goldman bankers. We eagerly look forward to all of that discovery evidence being laid out by the prosecution.